Yeah, I’ve got a lot going on, this blog included. I have my obligations, and oh, they do seem to press. But I also have everything I need to meet them. I have food, shelter and ready cash. I have a phone and a computer. I live in one of the world’s safest, most efficient cities. I’m supported by an infrastructure so well-maintained that I cease to think about it at all, except in the rare cases when it fails. And when that happens—when, for example, Toronto’s subway trains halt in their tunnels, I can measure that failure in minutes lost. Not lives lost. In convenience—not quality of life—compromised. Imagine that. 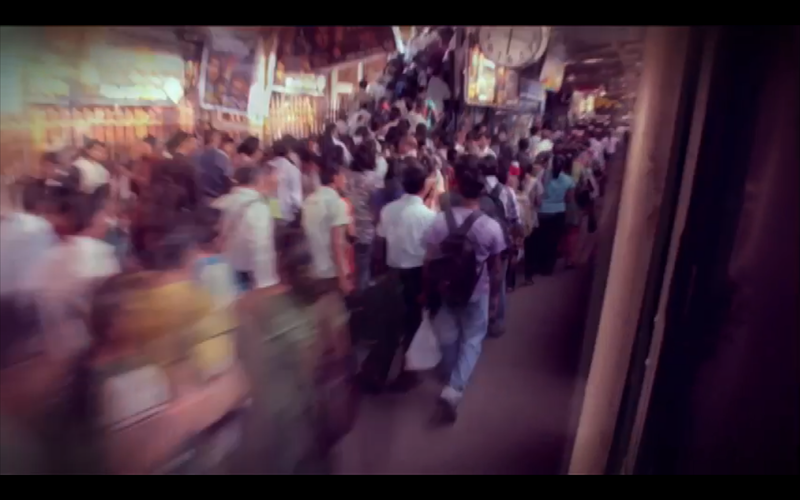 Imagine your daily commute—the tedious time between—could kill you. And not because you live in a society filled with constant threats, but because there’s so very, very many people, and not enough trains, and everyone just wants to get home. That’s what being busy’s all about—it’s not the amount of work you have, but how much life you give away because of it. 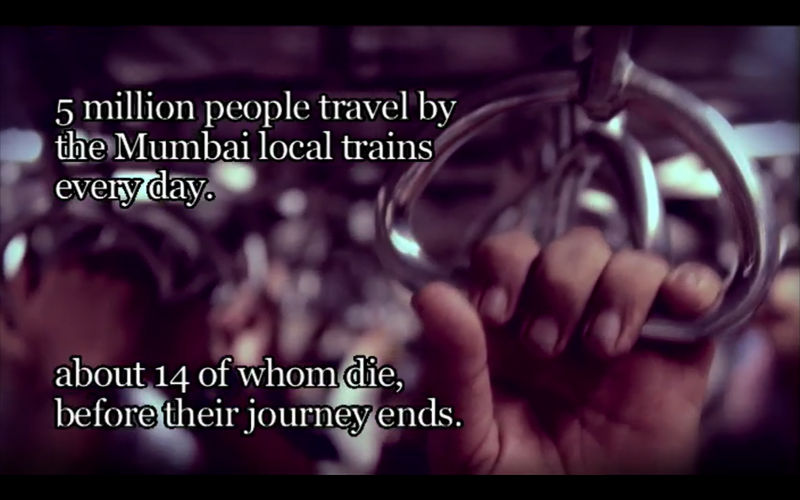 Daily Violence is a minute-long silent film, shot and edited by Indian independent filmmaker Payal Kapadia and her cameraman collaborator, Stuart Dacosta. The pair boarded Mumbai’s commuter trains and captured footage for several days, mostly between 4 and 7:30 pm, when the trains get most crowded and the people, it seems, go a little mad. The film begins and ends calmly: our first image is a row of hands clutching steel loops overhead; sixty seconds later, we see the interior of a train-car filled with passengers seated and standing, some holding those same loops, everyone still. But between these scenes is chaos. 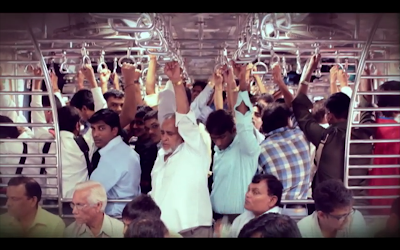 The commuters don’t simply shimmy or squeeze in, they commit assault. They throw elbows and shove. The train-cars have doors, but the doors don’t close, so the crowds of passengers bulge out of the cars while new arrivals crawl desperately over (not into) the lot of them, clinging to poles inside the cars until others pry their fingers free and they stumble back to the platform. All this before the train starts moving again. When it does begin to roll, we see more commuters holding on to the sides of the cars, and one pair sitting on the roof. That only 14 will die that day seems a testament to their fitness, balance, and determination. The commuters aren’t oblivious to this. I remember the disgust on one middle-aged woman’s face after she failed to push her way up into a body-filled car. Hers is the only face we see clearly in the film; everyone else is focused on the short-term goal of getting aboard. As was she, until her technique failed her. For a split-second we see her turn away from the masses and in that moment, she seems to show contempt for both her fellow passengers’ behaviour and the futility of the situation. But here’s the real question: will she act differently than they do tomorrow, or the day after that, when the commuter’s cycle is repeated? Kapadia’s film was the ‘Urban Journeys’ category-winner at this year’s Toronto Urban Film Festival (TUFF). 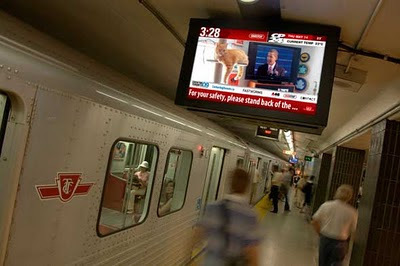 TUFF films, all a minute long, run in loops on the Toronto Transit Commission’s (TTC’s) platform-level information boards, operated by OneStop Media. The boards have no speakers, so any film shown on them must be silent. Kapadia wasn’t concerned about this; she considered sound to be superfluous in her case. In fact, she believes the silence makes her images even more harrowing. I wonder, though, if that’s quite the impression Toronto commuters got, watching the film from their subway platforms. Because there, even at the busiest times, the background noise is staid. The Canadian crowd is stern and mostly silent while it waits. The trains rumble up with a steady click-clack. A three-tone chime signals the closing of the doors. A voice over the PA—cheery at best, firm at worst—chides riders to move to the back of the car, to make room. These are the sounds of the commute in Downtown Toronto, and how dissonant they must have seemed against the manic scenes in Daily Violence. They were, Payal. Shocked, and maybe a bit humbled. I still am. I don’t know what busy is. An entirely silent version of Daily Violence can be found on TUFF’s website. Payal Kapadia’s blog is here. In recent years, I've taken a strong interest in issues pertaining to sustainable transportation (mass transit, bicycles, etc.). Most of the time I read about the effort to get NIMBYs and local politicians to fund mass transit and to stop bending over backwards to support car drivers. It's rare to see an instance where the demand for mass transit exceeds the supply to such an enormous degree. Thanks for writing about this film; it's a fascinating look at another culture. I found the contrasts with my own city's transit situation to be striking. Transit is a major political football in Toronto--the green movement on one side, alienated suburbs on the other. Here, the debate centres around problems which won't manifest for 10 years or more... not that that's a bad thing to be worried about, either.